St Mary’s Church lies in the heart of rural Suffolk. The square flint tower stands on ground 50 metres above sea level dominating the village and surrounding farmland, with magnificent views over the Deben Valley. The Church consists of a Nave and Chancel dating from the twelfth century, a fourteenth century West Tower and an early sixteenth century South Porch. 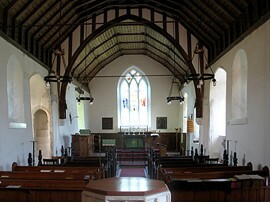 The Nave has a ‘modern’ wagon roof built in the 1906 restoration. There are two Norman windows in the Nave, the other windows date from the fourteenth century. The Chancel roof is panelled and decorated with flower bosses also dating from 1906. In the north wall the rood loft stairs are set into the thickness of the wall although the rood screen was removed during the reformation. Beyond the wrought iron communion rail is the sanctuary with a Jacobean communion table. The stained glass in the centre of the East window is a memorial to the men of Monewden who fell in the Second World War. The poppy head benches date from about 1480. The fifteenth century octagonal Font with plain hanging shields stands on a large raised stone base in front of the south door. There is a ring of six bells which were cast from the three old bells in 1890. The bells were re-hung in a new metal frame below the old wooden frame in 1990 by Whitechapel Bell Foundry. The flint tower was built in the fourteenth century with, it is thought, the elaborate cornice and flush work parapet to the top of the tower and on the buttresses and the West door being added 100 years later. St Mary’s Church is the oldest and most significant historic building in the village. It has a prominent place in the local landscape. Disability access: Both the path and Church are accessible for wheelchairs. Parking is available on the verges outside the Church gates. We have an Appeals Committee that raises funds for the fabric of the Church. The third Saturday of every month we hold a Saturday Café with coffee, tea, bacon roll and most importantly a chat. We hold an annual BBQ, a Spring Sale and a Wine Tasting. Throughout the year we support various charities such as Farm Africa, British Legion, Christian Aid and the Local Hospice by donating the collection at special services. We also donate to CMS through our collecting boxes, donate the proceeds and collection from the Harvest Festival to The Deben Family Centre and the gifts and collection from our Toy Service to the Ipswich Women’s Refuge.